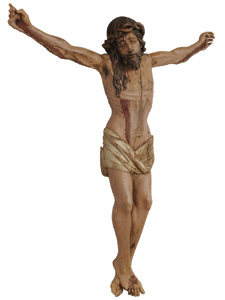 We are now standing before a crucifixion scene that illustrates a kind of unique iconography that was later copied profusely. It is most characterized by a combination of expression and elegance, which manage to avoid deformity and gesticulations that tend toward pathos. The forehead pierced by the crown of thorns is particularly well worked. The head is inclined to the left and the viewer's gaze is guided by a placid gesture. This piece is attributed to Alejo de Vahía, an artist of Germanic blood who was active in Palencia in the late 15th century. His work could be found throughout a large part of the Kingdom of Castile up through the first decade of the 16th century. The work of this sculptor and his workshop is easily identified thanks to several unique style elements which define the artist's hand and are easily detectable-uneven folds in the shape of a U, downcast eyes, large thin hands, locks of hair over the forehead and others. The museum has the best group of sculptures attributed to Alejo de Vahía, his collaborators and his followers. In total nine pieces, all on different themes, were collected by Marès over the years. This piece was donated to the museum in 1989, and is considered one of the artist's best works.